Found a home in Tremont, IL. Circa 1905, this curved Arm Gas Sconce has an oval back plate with a beaded border and medallion gas keys. 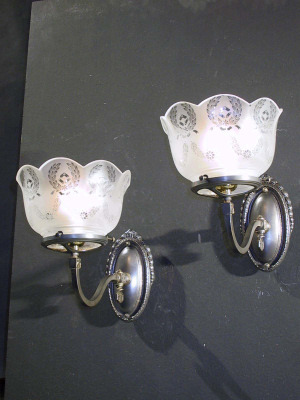 The floral pattern Transfer etched gas shades accompany these sconces.7 1/4" length x 7" width x 12" from wall.